BidScaler wanted to build their first website as a mobile friendly and more visual platform that showed their visitors what their application can do with all of their features. 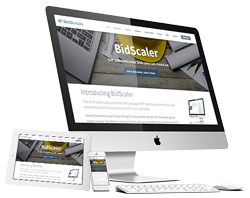 It is a start-up website and they wanted to communicate the strengths of the application: “The #1 trusted subcontractor bid package RFP tool that commercial and residential contractors count on for accurate bids”. We created a responsive WordPress brochure website for this powerful application. It is instantly more appealing and features screenshots of the application to demonstrate its strengths, credibility and professionalism. The website is built to attract visitors into free trial users (then paying customers) with a flowing design that engages them, includes calls to action, and features attractive visuals and copy that solves user’s problems while appealing to their desires. Customers can browse the website on any device – PC, tablet or smartphone. A completely new responsive brochure site that appeals to future clients and demonstrates the strengths of the application.